Food companies don't have to resort to using toxic synthetics or industrial byproducts for food preservation. According to a third-party watchdog group, the Environmental Working Group, there are now 10,000 or more additives allowed in food. While some additives are more dangerous than others, including carcinogenic meat preservatives like sodium nitrates and nitrites, there really may be no need for most of these ingredients anyway. Why complicate food products? Why subject the population to synthetic ingredients that interfere with normal body processes? The good news is essential plant oils are already revolutionizing food preservation. With essential oils, food preservation can be kept simple and non-toxic, and can actually benefit consumer health. The natural plant oils possess antibacterial properties that can keep foods contaminant-free and boost the body's natural defense system. The antioxidant properties of some essential oils can give foods a longer shelf life while providing beneficial, antioxidant, anti-aging properties to the consumer. Carvacrol is the broad-spectrum antimicrobial agent extracted from oregano and thyme. Nearly half of thyme (45 percent) is made up of carvacrol, and up to 74 percent of oregano is made up of it. Science shows that carvacrol releases lipopolysaccharides, obliterating the outer membrane of gram-negative bacteria. It's also an effective weapon against gram-positive bacteria, manipulating bacteria membranes by altering the permeability for H+ and K+ cations. This leads to bacteria cell death. The success of carvacrol lies in the presence of a hydroxyl group in the structure of its phenolic compounds. Carvacrol is also a powerful antioxidant. By preventing free radical scavengers, carvacrol can keep food from spoiling. It also terminates peroxides, prevents hydrogen abstractions and destroys singlet oxygen formation in a way that can be used to prevent lipid oxidation in entire food systems. The properties of Rosmarinus officinalis (rosemary) essential oil scientifically take out gram-positive (Staphylococcus aureus and Bacillus subtilis) and gram-negative (Escherichia coli and Klebsiella pneumoniae) bacteria. Rosemary contains a plethora of monoterpenes which disrupt the integrity of bacteria cell membranes. These strong plant powers include alpha-pinene, beta-pinene, myrcene 1,8-cineole, borneol, camphor and verbinone. Clove essential oil is a rich source of phenolics. These organic compounds contain one carbon atom attached directly to a hydroxyl group (-OH). This aromatic ring shares the hydrogen atom with free radicals, halting the oxidation of other compounds. In scientific studies, clove's phenolic properties showed high scavenging activity of the destructive DPPH radical. Clove essential oil also tested for high ferric reducing power, with the ability to quench singlet oxygen molecules and chelate metals. Additionally, turmeric and ginger root essential oils also exhibit free radical scavenging activity. Adding these essential oils to foods may change the smell of those foods, since many of these phyto-properties are aromatic. The aromatic compounds may best be added to the food packaging, not the food itself. By utilizing the technology of smart packaging, essential oils can be strategically worked into the packaging to increase the essential oil's abilities. Essential oils can be added to packaging in ways that improve water vapor barrier properties of protein-based films. For example, when essential oils of ginger, and turmeric are added to fish- and gelatin-based films, water permeability is decreased drastically, protecting the food product from spoilage. By adding the essential oil to the matrix of the food packaging moisture can be repelled, thus extending the shelf life of the product. Essential oils are the answer for food preservation, not the thousands of synthetics that interfere with the body's natural functions. Simple combinations of essential oil phytochemicals could potentially replace hundreds of food additives and toxic preservatives. Their antimicrobial and antioxidant properties destroy the cell membranes of bacteria. By combining these essentials into the structure of food packaging, moisture can be repelled, reducing spoilage of food across the board. A vast part of the human immune system exists within the human gut. This often times under-developed part of the immune system should include a strong colony of beneficial microbes. These friendly microbes carry out important functions that allow the body to defend and heal itself. Specific supportive microbes react to stress signals in the body and hasten the production of antibodies to fight infections. Some help the body utilize nutrients. Others help guard the gut wall and eliminate toxic substances before they travel into the blood. The standard, glyphosate and antibiotic rich American diet depletes the colony of good bacteria in the gut, leaving people weak and defenseless to all pathogens. When our friendly microbes are depleted by things like glyphosate and antibiotics, we are more prone to infection and illness, over and over again. There are actions we can take to limit our exposure to glyphosate and other antibiotics. For one, we don't need to run to antibiotics (the doctor) every time something is wrong with us. Two, we should carefully examine our livestock feeding practices (which often include antibiotics to stimulate growth). We can also eat fermented foods and probiotics to rebuild the gut. One of the most versatile probiotic-rich foods is apple cider vinegar with the mother. It's great to consume a tablespoon of this in water before bed and in the morning after getting up. Finally, the best gift we can give to the next generation is to make clean, nutritious human breast milk available. Human breast milk helps colonize the good bacteria in the infant's gut and intestines, helping their bodies handle a world of unseen pathogens. Pathogens and other toxins from food and water can readily penetrate the gut wall if the microbial defense system of the human gut is depleted, unbalanced. Building that network of beneficial microbes should be a parent's first priority when their infant is brought into the world. That's why breastfeeding is so important. Breastfeeding support should be the center of focus in preventative medical care and immunology - long before vaccines are even mentioned. The quality of breast milk and the colonization of beneficial microbes in the gut is what determines an infant's immune system and its ability to face potential pathogens in life. Scientists at Queen Mary, University of London have isolated a specific component of breast milk that protects the gut wall of infants. This top notch breast milk component even repairs intestinal cells when they are damaged by toxins and invading pathogens. This special component is called the pancreatic secretory trypsin inhibitor (PSTI). Intrestingly, the amount of PSTI is seven times greater in colostrum. Colostrum is the yellow-colored medicine produced by a mother's breasts in the first few days after giving birth. The Queen Mary scientists have found that PSTI protects the lining of the newborn's gut in profound ways. This is important especially since the newborn's body may have already been burdened by the chemicals in a synthetic vitamin K shot, which is a medical procedure routinely forced on babies born in a hospital. The Queen Mary scientists examined the effects of PSTI in the lab on actual human intestinal cells. When they damaged the intestinal cells, they witnessed PSTI from breast milk coming to the rescue, moving toward the damaged area. The PSTI helped form a natural protective barrier and helped heal the intestinal cells. Furthermore, the PSTI showed promise for preventing future damage by preventing the intestinal cells from self-destructing under pressure. The researchers discovered PSTI can reduce damage of the intestinal cells by 75 percent! "We know that breast milk is made up of a host of different ingredients, and we also know that there are a number of health benefits for babies who are breastfed," says lead author of the study, Professor Ray Playford of Barts and the London School of Medicine and Dentistry, part of Queen Mary, University of London. "This study is important because it shows that a component of breast milk protects and repairs the babies' delicate intestines in readiness for the onslaught of all the food and drink that are to come. "It reinforces the benefits of breast feeding, especially in the first few days after birth." How much aluminum is in your drinking water? The best way to get rid of most dietary aluminum is by using scientifically validated water filters. In a 15-year study on French elderly men and women, regular consumption of tap water was associated with aluminum toxicity and increased prevalence of dementia. How might the accumulation of aluminum from just tap water alone affect your cognitive ability as you age? In the 15-year French study, researchers found out that dietary aluminum from water sources could be a risk factor for developing dementia. How much greater could direct unfiltered aluminum affect a small, developing body and brain? The sad answers are all around us. Not only have negative neuro-behavioral outcomes from aluminum exposure been measured in animal studies (restlessness, muscle tremors, loss of response to stimuli), but they are also seen in humans today, with increasing numbers of children falling into the autism spectrum. The presence of aluminum in central nervous system tissue causes altered expression of certain genes in the brain. Aluminum is changing our genetics, destroying who we are with every dose. A 2009 report from the American Journal of Epidemiology details this 15-year study from France. The study followed the lives of 1,925 elderly patients between the years 1988 and 2003. All of the elderly men and women were selected from 91 different municipalities with different water sources in southern France. Their aluminum intake levels were studied, from water and other sources, as the researchers investigated the metal's role in bringing about dementia throughout the 15-year period. During that time, the researchers also investigated the impact of silica in reducing participants' risk of dementia. Of the nearly 2,000 elderly studied, none showed any signs of dementia beginning in 1988. Aluminum from drinking water was correlated with increased dementia in the 15-year study. The researchers ruled out environmental aluminum intake factors during the study and focused solely on aluminum intake from water. The participants' daily consumption of tap and bottled water was recorded. Reliable water assessment data was analyzed. In the study, aluminum consumption greater than or equal to 0.1 mg per day from drinking water was correlated with declining cognitive ability. Over the years, the accumulation of aluminum inflicted negative mental effects, welcoming dementia in what was once a mentally healthy group of elderly adults. Using the scientific Cox model, the researchers found that highest exposure to aluminum may be a risk factor for full-blown dementia. If parents follow the CDC's recommended vaccine schedule that most doctors push, then in year one of a child's life the infant will be injected with more than 4,000 micrograms of aluminum from a myriad of vaccines that claim prevention. How does this overload of aluminum retard a child's cognitive development, especially since an infant's body is much smaller, more vulnerable, and in crucial stages of development? When aluminum is consumed over time (as in water) only a small amount is absorbed into cells (if the kidneys are properly filtering it from the body). With injected aluminum, the risks are greater because it is injected directly into muscle, where it may be absorbed at nearly 100% efficiency over time and can accumulate in organs, including the brain. If .1 mg of daily consumption of aluminum was equated to the onset of dementia, and if much of that is being filtered out by seniors' kidneys, then how devastating could aluminum damage be, if infants are injected with roughly 4000+ mg of aluminum in their first year of life (if they are forced to endure the CDC's vaccine schedule). In trying to prevent disease with runaway vaccine ideology, health authorities are inadvertently poisoning small developing bodies with inane amounts of aluminum while looking past nutrition's role for providing immunity for all disease. Since the US is the most vaccinated country in the world, its people are the most poisoned by direct aluminum exposure in muscle tissue. The neurological damage is evident. The French researchers did find a helpful solution to counter aluminum toxicity and thus thwart dementia. They found that the mineral silica could help decrease the risk of aluminum-induced dementia in elderly patients. Hoping to the help the participants, the researchers looked further and assessed silica intake for its ability to reduce dementia. What they discovered was that when participants increased their silica intake by 10 mg/day, incidences of dementia subsided. The change was drastic. This discovery coincides with the expert analysis of Dr. Chris Exley, PhD. At a January 2011 vaccine safety conference in Jamaica, Dr. Exley talked about ways to reduce the toxic effects of aluminum in the body. He talked about the importance of silica and mentioned two brands of silica-enhanced water, Volvic and Spritzer. After conducting several urine tests, Exley and his team of researchers proved that high-silica mineral waters help remove aluminum from the body. In a presentation involving victims of Gardasil vaccine's adverse reactions, Exley showed how silica improved the negative outcomes caused by aluminum-laced vaccines. Based off 20 years of study, Dr. Exley recommends drinking a liter of silica-rich water daily to reduce the burden of accumulated aluminum in the body. There are also many great whole food supplements on the market today that contain silica. One of the sources of silica not mentioned above is horsetail. Respected as a strong diuretic and astringent herb, horsetail is a fern-like, nonflowering weed that is loaded with silica. The tall, hollow stems resemble asparagus and often grow in bunches. When the plant begins to dry, silica crystals form in the stems and appear to look like feathery tails. This herb can be purchased as a dry powder and can be used raw to make tinctures. The silica content of horsetail is unmatched and is famous for helping people grow healthy hair, nails and skin. With its high silica content, horsetail may be good for removing aluminum from the body, warding off dementia, and helping children and young adults detoxify from the insane amount of aluminum they were exposed to as a child. If you are looking for silica enhanced drinking water or want to get more of this important mineral in your diet, please reach out to me via our contact form and I will put you in touch with someone who can help. Silica: The Forgotten Nutrient by Klaus Kaufmann (alive Books, 1993). There's a lot of fear and misunderstanding when it comes to being out in the sun. Confused and afraid of skin cancer, we are quick to lather on sunscreen chemicals to block out the sun's rays. This is done without hesitation, without understanding what these chemicals are or how they distort the body's natural hormone levels. Stuck in this fearful mindset, it's easy to neglect the importance of daily sunlight exposure for prevention of all disease. To maintain a healthy immune system, we should embrace 15-30 minutes of sun exposure each day, instead of avoiding it. Studies show that 77 percent of cancers are prevented when one produces adequate vitamin D from the sun. When we rush to block out this important component in our life, we set our bodies up to welcome disease. Sunburn is NOT proof that the sun is a dangerous, cancerous vessel. Of course, one must know their limits and seek shade when necessary; however, sunburn may indicate an imbalance, a disconnect between humans and nature. Instead of fearing sunburn, one should be finding ways to protect their body from the inside out by consuming and assimilating greater quantities of antioxidants. Most people are disconnected from the science of nutrition found in living foods. Most people are not eating and absorbing the phyto-nutrients that help with internal sunlight regulation, oxidative stress, and vitamin D production. Key antioxidants are missing from the standard diet, such as selenium, carotenoids, lignans, lutein, lycopene, and all sorts of polyphenols/flavanoids. Powerful antioxidants like astaxanthin help protect the skin from the inside out, naturally preventing UV radiation damage. Astaxanthin is a phytonutrient synthesized by a species of micro-algae called Haematococcus. It has a deep red hue and can be seen in salmon because they feed on the fish that thrive on the micro-algae. Sunscreen chemicals are like a temporary shield that doesn't get to the root of the sunburn problem. These chemicals are not always effective either. There's no scientific proof that these chemicals protect the skin from damage or cancer. In many cases, sunscreen chemicals pose more risks than rewards (especially since they are interfering with the body's delicate network of hormones). One common sunscreen chemical called oxybenzone disrupts hormones and is linked to endometriosis in females and low sperm count in males. The Environmental Working Group reviewed a large number of commercial sunscreens and found out that half of them used the hormone-disrupting oxybenzone as an active ingredient in their formula. When oxybenzone penetrates the skin, it acts like estrogen in the body. This may trigger allergic skin reactions and can negatively affect the reproductive systems of both males and females. For females, this disruption can cause tissue that normally lines the inside of their uterus - the endometrium - to grow outside their uterus. This causes severe abdominal pain and may lead to infertility. Furthermore, oxybenzone has a 1 to 9 percent skin penetration rate in lab studies. It's detected in most Americans' blood and can even make its way into a mother's breast milk. Other sunscreen chemicals like octinoxate, (octylmethoxycinnamate) exhibit hormone-like activity and can alter the function of the reproductive system, thyroid and even behavior in animal studies. Another common ingredient, homosalate, can disrupt estrogen, androgen and progesterone levels. Exposure to hormone-disrupting chemicals can change the very nature of a man or a woman at the hormone level. Instead of disrupting natural hormone levels with sunblock chemicals, it's best to reconnect with nature and work with natural sun protective plant extracts and minerals that allow the skin to replenish and heal. Healthy oils like extra virgin olive oil, wheat germ oil, avocado oil, coconut oil, and jojoba oil all have documented sun protection factor. 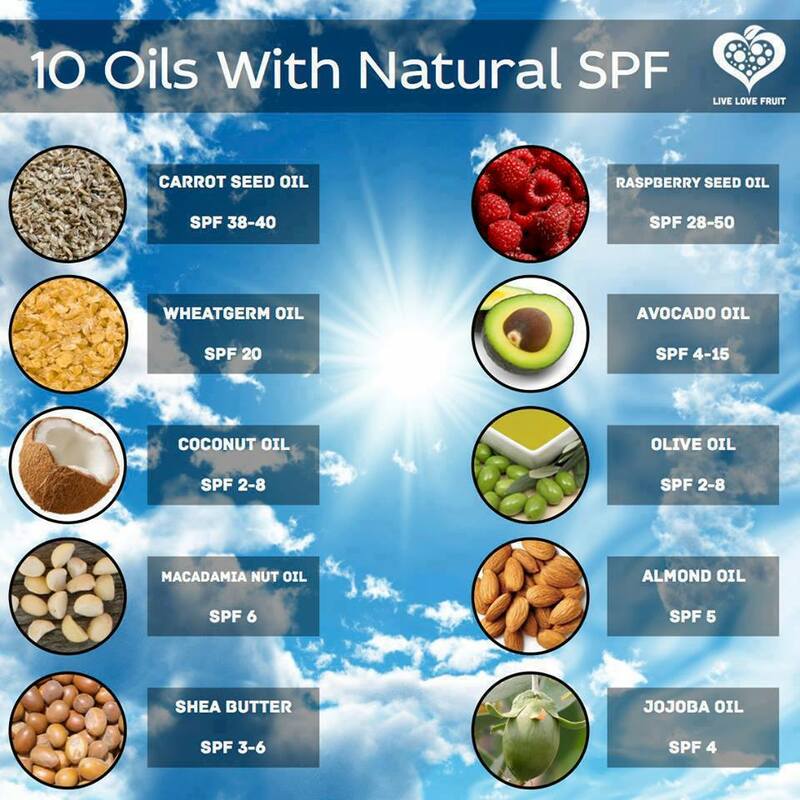 Carrot seed and red raspberry seed essential oils have significantly high SPF. Zinc oxide is a mineral sunscreen that can reflect both UVA and UVB rays. The difference between natural substances and synthetics is that healthy plant oils aren't disrupting the body's natural hormones. In this way, plant oils are allowing fo more efficient vitamin D production, because vitamin D is essentially a hormone. A healthier diet, full of antioxidants allows the body to internally regulate the sun's energy. While it's important to know one's limitations and find shade intuitively, no one should have to fear the sun. Be wary of the chemicals in day-to-day use, not the sun. Here you will find motivation and strength to activate new habits and lifestyle choices to increase your inner resilience. This blog will explore divine science, Mind over matter, the power of the human spirit, nutrition utilization, herbal wisdom, plant based medicine, detoxification, and more. Lance Johnson is a passionate writer and holistic wellness advocate who has published hundreds of articles for the top Natural Health news site on the web, NaturalNews.com. Lance loves to study nutrition and plant-based medicine to implement natural approaches to healing in his own life. He and his wife have naturally been healed from a myriad of health problems, including migraines, sinusitis, urinary tract infection, sciatica pain, cysts, and infertility. Lance and his wife started AllNaturalFreeSpirit.com in 2012 to provide others with pure options in body care that are free from hormone-disrupting chemicals. He and his wife plan to start a new business in 2017, Live Pure Body Care, to reach more people who are looking to improve their health.